Wooo Hooo! What a fun weekend SSUSA was. 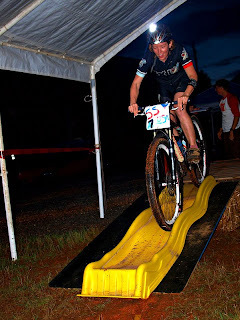 Saturday offered up a short track race and a night time trial. 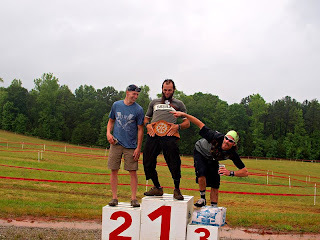 I was super confused when they called me up to stand in #1 on the podium. 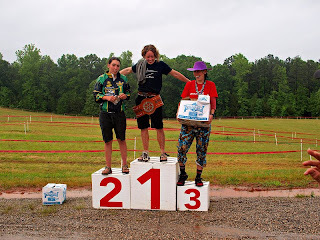 I placed 2nd between Kylie and Rebecca in both events on Saturday and about 4th of 5 on Sunday's 20 mile cross country race...but I won the kiddie bike bike race which was the race for the belt and SSUSA champion...Marshall "of course you did." This weekend was awesome fun all around and I got the opportunity to meet some awesome folks. Thanks Robb for putting on an awesome event. Here's a photo of the men's belt podium. DeJay got first and yeah that's Pisgah Works very own Bruce in third. You Go Girl! nice work! hellz yeah, lady! you should make Marshall wear your belt. You know he's jealous! Great job. I knew you had it in you having rode with you at the Cowbell for a while only to watch you pedal away. Then I say you chilln' at ORAMM by the time I crossed the line. Thanks boys! Ya'll are awesome!